Tomorrow is my grandmother's birthday. She would have been 94. She gave herself to the world and we loved her back. She inspired us - her family, friends and fans to embrace all parts of ourselves and live life to the fullest with conviction and imagination. She encouraged us to "tesser well". "Tesser Well" is how she signed copies of A Wrinkle in Time. It references not only the fourth dimension travel through time and space, it also alludes to her basic philosophy that whenever we open our minds and heart - whether it is mind-travel through reading, or spiritual-travel through being vulnerable and loving, we and the planet are better off. Madeleine was one of the most accessible writers of her time. If she were alive today, she would be all over social media and interacting with her fans in new and fun ways. We have been mourning that she can't do this herself - we have been feeling the pain of her loss. But what if we got together as a community to keep her legacy shiny and golden? Hmmmm . . . well guess what? There IS a new fan page on Facebook called Tesser Well that launched just yesterday! It's that virtual place where Madeleine we can all share, interact and gather information. 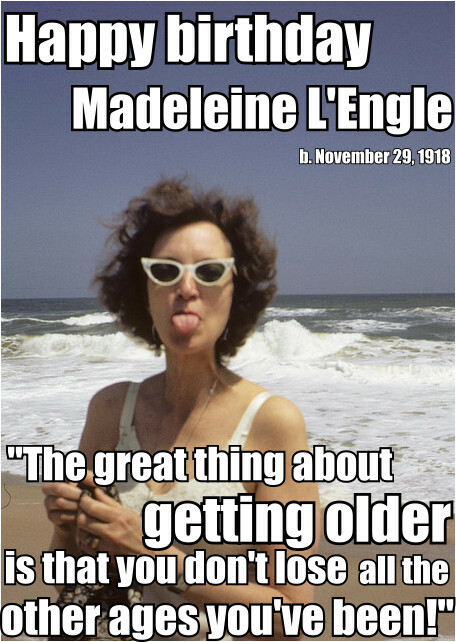 You can also have more access to all things Madeleine by following her on twitter @tesserwellMLE. In Madeleine's honor, let's have the phrase "tesser well" join the ranks of "May the force be with you", and "Live long and prosper". Join the revolution! 4) Follow me on twitter @lenaroy and retweet! 5) Share this blog post on Facebook! The random winner will be picked and announced next Wednesday, December 5th. My favorite way to Tesser Well is to share what I love with those around me! I think maybe books is how I Tesser Best. I already follow your blog and Facebook...I do not Twitter so alas, not you either. :) Is this your grandmother at the beach? If so, so much hair! Live well, love hard, have no regrets. That is a life well Tessered. I am so excited about this new Tesser Well fanpage! Reading, writing, and loving are how I tesser. Hi Judith! Thank you for sharing and for tessering well! 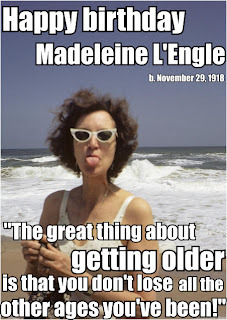 Happy Birthday to Madeleine! I can't wait for my kids to read her stories! In our family, we tesser through sharing true stories from our past. Whether it be my grandfather writing his memoirs (I am unduly proud of the fact that I am the one who persuaded him to do that! ), or my dad and his siblings sharing childhood memories via email after losing my grandmother's mind to Alzheimer's, or my uncle scouring every source he can find for old bits of information on our ancestors, we connect to each other better via these stories, and somehow then to the world. I do follow you on Twitter; I retweeted this post; and I'm off to find you on Facebook! I love this Louise! So great to "meet" you! Love this! I tesser by helping Creatives see the familiar in unfamiliar ways so they can open hearts and blow minds...starting with their own. Keith, I so love what you do! I just realized I can ask God for a wrinkle in time when I pray. I guess that might be tesserpraying? Your grandmother's work helped me fall in love with reading as a child and continues to inspire my writing and reading today. Blessings! Oooooh - fabulous Marti! Love that insight! I Tesser Well by sharing my copies of your grandmother's books with my children. I have read them over and over again and I love discussing them with my daughters. Isn't sharing what inspires us the best? My favorite way to tesser is to share the books I love with people I love--this fall, I introduced "Wrinkle" to several college students by giving them the title as one reading option in our modern myths and fairy tales unit. They loved it! We can money every kind of assessments. Want your cash checked? We are able to serve you what you are wanting like take a look at cashing near American nation it's very smooth to are searching for out U.S.A. At your nearest locations. Our workplace is opened 24/7. Good to be fully engaged.